What’s the difference between a sonic and ultrasonic electric toothbrush? 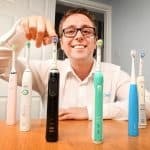 A brief buying guide: who makes the best ultrasonic toothbrush? Most of the brushes we review here at Electric Teeth are sonic, such as those from Oral-B and Philips. However, there is another type of brush to consider: the ultrasonic brush. These are rarer to come across, but they were still available on eBay when we last updated this article. In this post we’ll be taking a look at the key differences between the two types of brush, and there’s an infographic further down showing the two side by side. If you are looking to compare a range of different brushes side by side, you may like to see our full list of electric toothbrush comparisons. To be classified as a sonic toothbrush, the motion or vibration from the brush has to be quick enough to produce a ‘humming’ sound that is within the audible range of the human ear (20 Hz to 20,000 Hz). Sonic brushes typically offer 12,000-24,000 oscillations or 24,000-48,000 movements per minute. Sonic brushes rely on a sweeping motion alone to clean the teeth, the movement that they provide is often high in amplitude which means they offer larger sweeping brush stroke motions. It is the bristles on the brush head that move at this speed to essentially brush away food particles and bacteria that sit on the teeth and gumline. Sonic toothbrushes should not be confused with ultrasonic toothbrushes which operate at a much higher frequency and use ultrasound rather than the motion of the brush head to remove plaque and other bacteria. 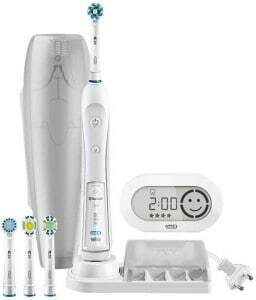 Examples of a sonic brush include Oral-B’s range of electric brushes as well as Philips Sonicare range. You can see some of our reviews here. Ultrasonic toothbrushes unlike sonic ones do not rely on a physical motion to clean the teeth. An ultrasonic toothbrush is one that uses a very high frequency of vibration referred to as ultrasound to remove plaque and bacteria from the teeth. To be classified as such, the brush has to emit a wave of 20,000Hz or 2,400,000 movements per minute, considerably more than the very popular sonic technology. Within the USA, the Food and Drug Association (FDA) actually specify a minimum of 1.6MHz or 192,000,000 movements per minute. The high frequency waves, but low in amplitude means the bacterial chains found in the mouth that make up plaque are broken up by the vibration and can work as far as 5mm below the gumline. Essentially speaking the brush can clean the teeth simply by resting the brush on it. An ultrasonic brush compared to the more commonly seen and used sonic brushes does not need a physical motion to clean the teeth surfaces and gumline. However many ultrasonic brushes do also provide additional sonic vibration ranging from 9,000 to 40,000 movements per minute, in order to provide additional sweeping motion which removes food particles and bacterial chain remnants. An example of an ultrasonic brush is the Megasonex (pictured above). Whilst ultrasonic toothbrushes have been shown on a limited scale to be effective (1 & 2) the reality is that few such toothbrushes are made and are available to buy today. The market is dominated by Sonic toothbrushes, notably those from the largest household brands. There are several toothbrushes that suggest they are ultrasonic, using such words in the product title and description, but in fact they are just standard sonic toothbrushes, operating at up to 48,000 movements per minute rather than using ultrasound to achieve the cleaning. It is my understanding that at the time of writing, the brands who do make true ultrasonic brushes are Megasonex, Smilex and Emmi-Dent, so you’ll be best off choosing between these. Please be aware that at the moment I have not had hands-on with any of these, so cannot say definitively which is best, but they are the main manufacturers in this market. At the time of writing we couldn’t find any of these brushes available with UK retailers, but we did see both Emmi-Dent on eBay and Megasonex on eBay, so at the moment in time it looks like this is your best bet if you want an ultrasonic toothbrush. If you’re not specifically looking for ultrasonic, but rather a ‘standard’ electric toothbrush, check out our post that looks at the best sonic toothbrushes. To help summarise the key differences of sonic vs ultrasonic toothbrushes, we’ve put together the infographic below. I’ve looked at both the Emmi dent and Emmi pet and can see no difference in the equipment except the toothpaste yet the pet one is over £100 in the UK than the ‘human’ one. How are they so different? I have not been hands on with either of these to comment with absolute certainty. There does however seem to be no clear obvious difference between the 2, bar the name/packaging, having had a quick look. Information and product details are sparse and inconsistent to be able to say fully. The Emmi-Pet is silent and with no vibration whereas the Emmi-dent vibrates and the motor still makes a noise. The extra cost is due to the cost of developing and creating the silent motor for the pet version. For humans, we like obvious evidence (sound and sensation) that something is turned on, whilst this can be very off putting for pets. Ultrasonic brushes are the biggest scam in the world. I am absolutely convinced that the only reason both Megasonex and Smilex even work at all is that they have the additional sweeping (“sonic”) motion on top of the ultrasonic waves. As for Emmi-Dent, to insinuate that all you need to do to brush your teeth is HOLD THE TOOTHBRUSH ABOVE THE SURFACE OF THE TOOTH without sweeping at all is not only misleading but incredibly irresponsible. EVEN IF the brush could somehow break up the bacterial chains (which I highly doubt it can), the plaque wouldn’t just disappear. It’s still necessary to remove it through mechanical brushing. Both oscillating-rotating and sonic are great compared to a manual brush. I am personally a fan of Oral-B, I have the Genius and it works wonders on my teeth. Sonic is not for me, I hate the high-pitch sound, but at least I know the brush is doing something unlike this ultrasonic stuff. Indeed Ultra Sonic brushes are not really proven and it is for this reason we recommend brushes like Oral-B and Sonicare over such models. Hi can anyone help ? Do these ultrasound tooth brushes work in U.K. plugs are do I need a adapter? These brushes should work in the UK just fine. However, it may depend slightly on which brush and where you are buying it from. It may come with a 2 pin EU plug that may require an adapter to work here in the UK. In that case, you are probably worth buying a 2 pin EU to 3 pin UK plug adapter as you wont see a 2 pin EU to 2 pin UK bathroom plug adapter normally. Did you have any problems with ulcers (afta) in mouth and if anyone did , did an ultrasonic brush help to fasten the healing process of the ulcers ? Yes actually! I used to get them regularly and now in the rare cases that I do, they heal much faster. It lends Credence to the idea that it really is destroying bacteria on contact, since the harmful ones are known to prolong the duration of these mouth ulcers. Of course I also worry a little bit about what it might be doing to the good bacteria as well… But I’ve had no negative results so far. I also use Weleda calendula toothpaste, or activated charcoal or homemade salt/clay based toothpastes without synthetic chemical cleaners like SLS. I’ve had no cavities since starting this regimen except for one that was “forming” according to x-Ray’s, which reversed and healed by the time of my next visit. This is kinda crazy stuff but I love it! I have a Megasonex toothbrush and can say that the build quality and ‘feel’ is excellent. Furthermore, the brush runs on a full charge for almost a month, and takes roughly 8 hrs for a full recharge from dead flat. 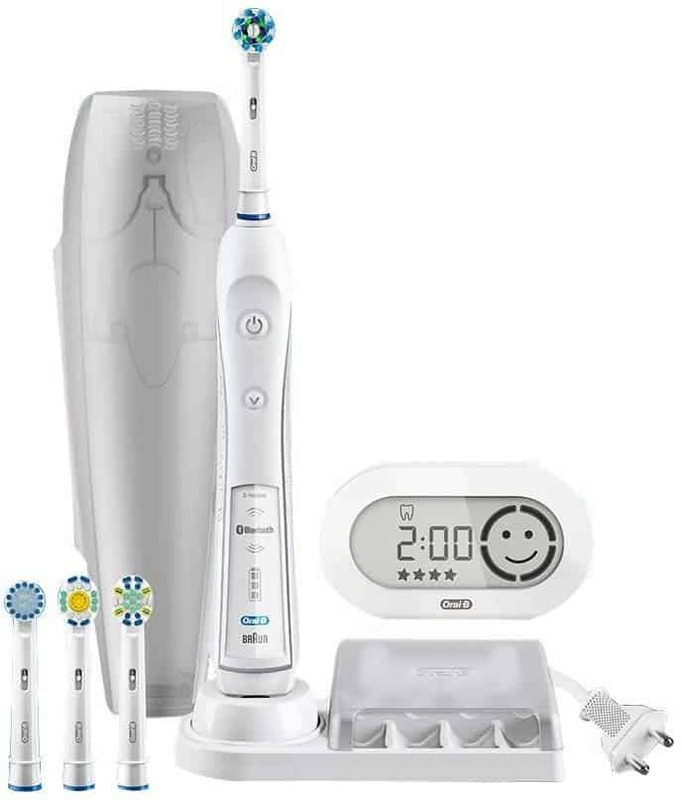 It has a timer that gives you three minutes to clean all surfaces of the teeth, with momentary interruptions to the sonic vibration every 30s helping to ensure equal coverage by dividing and focusing equally on areas of the mouth – e.g. upper left, centre, right teeth, and the same for the lower teeth. I’ve read much about the many rechargeable high-street brands that fail anywhere between 6 months up to typically 18 months, some with exhorbitant prices due to Bluetooth, dedicated apps, and all such modern tech marketing rubbish. On balance, I considered going with the Megasonex at an all-in cost (UK) of £160 from Germany via eBay. This means investment in technology that reportedly does the job more effectively, rather than your mobile app serving little more than as a regular brand ad’ in my opinion. Don’t pay more for a full kit that includes their special toothpaste – It’s not worth it, particularly as it can’t be sourced separately. I mistakenly paid a bit extra for the paste-inclusive kit at the above price, but in true eBay style the seller had the gall to stick a… “free gratis :)” paper label on the toothaste box! I personally use a toothpaste with neem bark from Amazon, relatively expensive but in combination a very powerful and effective combination with the Megasonex. Do ensure that you buy authentic branded brush heads as they contain the high-frequency resonators encapsulated just behind the brushes and can just be seen/confirmed with a powerful torch. Typically around £20 for a pair of replacement brushes, with recommended replacement at 3-month intervals. I’ve had the Megasonex for just over a month now and it does appear to be significantly more effective when compared to my Braun Oral-B which, incidentally, also has expensive genuine replacement heads that do nothing more than brush in the more conventional manner. On the strength of early ownership and reasonable personal experience, I would personally recommend Megasonex – also available as a twin-toothbrush kit for about £250 to the UK, again from Germany. A pity they’re not on general sale over here, though the UK does appear to be the worlds 5th richest nation with ‘no money’ in the public pocket so no surprises there, but I would say the investment is well-worth considering for perceptively-improved oral hygiene and personal health. Thanks for the detailed comment and feedback on the Megasonex, great to hear such positive things. Is an ultrasonic dangerous for implants? Hi Mimi. No, all is fine to use with implants. Hello,which brush do you recmoned better for dental implants-sonic or ultrasound? Typically Sonic are the most popular. Olivier, I don’t believe they would have any impact, given that your teeth essentially undergo more stress through eating etc. If you want complete peace of mind getting your dentists advice is advised, but from my knowledge and experience it should not be an issue. Thank you for all the comments, this was confirmed by the pacemaker team at Wolverhampton New Cross Hospital. Will ANY toothpaste work with an Ultrasonic toothbrush or does it HAVE to be a special one that produces nano-bubbles – what ever they may be? You can use any toothpaste. Do you know what these nano-bubbles that Emmi-pet rave about are? Could you please explain? Thank you for your time. Emmi-Pet/Emmi-Dent are not a brand I am all that familiar with but is seems like they focus on Ultrasonic products, so I will be doing more research. The Nano bubble are according to them: Specially formulated nano-bubbles are up to 1000x smaller and are able to reach between the teeth, into the smallest crevices, supporting and enhancing the cleaning effect of ultrasound. Nano-bubble cleaning removes plaque, tartar, food scraps and impurities. So it would seem that these smaller bubbles are supposed to get into the gaps and clean better. Whilst there may well be some truth in this, it is not clear who or what they are comparing their bubble size too. From all the pastes I have tested I have not come across the ‘nano bubbles’ before, but many brands come up with inventive marketing words/phrases. There is a requirement too for brush bristles to sweep away the plaque and bacteria, to the small bubbles getting into a gap is only part of the solution. Yes, it may deposit bacteria killing fresh paste under the gum line for example, but ideally you want bacteria to be removed too. The reality is that for a human a basic fluoride based toothpaste is fine in most instances. I see you o dog grooming. Despite being a dog owner myself I am not all that familiar with what is essential to a paste for dogs. Nano-bubbles I do believe will be the least of the worries in brushing a dogs teeth! I hope this shines a bit more light on things for you. I called a pacemaker manufacturer and asked them. They said that the ultrasonic toothbrush does NOT interfere with its functions, based on the toothbrushes that they are aware of. So, no problems using it. By the way, the info you have on Megasonex is incorrect (in the blue picture). It does not work on 20,000MHz, which does not translate to 2,400,00 movements per minute. The brush gives off ultrasound at a frequency of 1.6MHz (which translates to 96,000,000 pressure waves per minute or 192,000,000 movements per minute) and at the same time it vibrates at a sonic frequency of 18,000 movements per minute. 2 types of action at the same time. Walter, Good to see the pacemaker manufacturer has confirmed it does not interfer with it. The information on the graphic is aimed at a more general classification of Ultrasonic toothbrushes, but we do specify the 1.6MHz frequency for ADA approval. Will the Ultrasonic toothbrush affect my pacemaker? I bought an Ultrasonic massager for £212 but the instructiond say I cannot use it if I have a Pacemaker. A very expensive doorstop. It is our understanding that an ultrasonic toothbrush should not affect pacemakers as modern pacemakers are designed to be protected against such. Please refer to this post. That said it is always worth checking with professionals given that the instructions say so. It may be that the toothbrush manufacturer is just being very careful to protect themselves against liabilities. We are not medical professionals and are not in a position to give the final word on this. We are not aware of any issues but strongly advise speaking to your Doctor or the team that carried out your surgery. Please do let us know what they say as we would like for you to get some use from your current expensive doorstop!